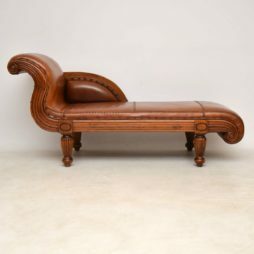 Antique Daybed | Interior Boutiques – Antiques for sale and mid century modern furniture, french furniture, antique lighting, retro furniture and danish furniture. 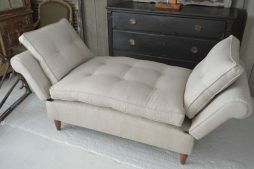 Lovely buttoned chaise/ daybed upholstered in a slightly course neutral linen with contrasting black velvet buttons to the seat and back scroll. 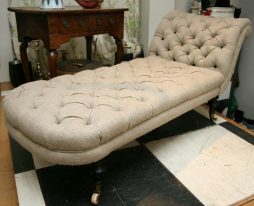 The chaise is quite low and has matte black ebonised legs on castors. 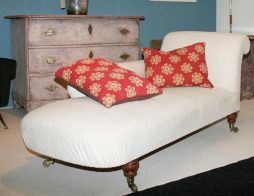 It would be perfect for a small sitting room or bedroom. 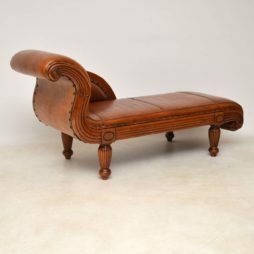 This antique Swedish chaise lounge is a stunning piece of furniture & very stylish too. The frame is solid walnut & the leather upholstery is all original. 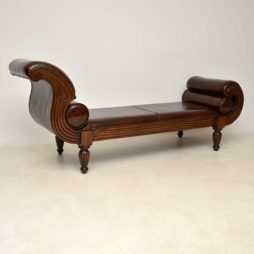 I would date this piece to around the 1880-1890’s period, although the style is Regency. The leather upholstery has loads of character & has natural fading. I love the design of the stitching & the original tacks onto the frame. There is a bit of wear, but no rips or holes, mainly on the top section of the leather & it is clearly shown in the images which you can enlarge. The leather has been polished & had the colour revived, but it’s all original, naturally distressed & quite rare to find with such a wonderful original colour. 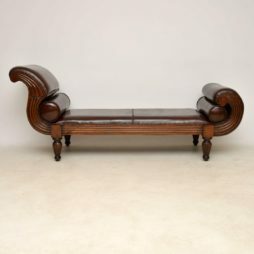 The solid walnut frame is beautifully shaped & carved, with a scrolled over head & foot rest. 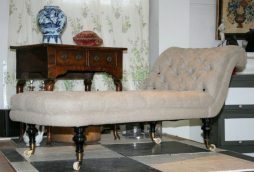 The frame is also fluted as are the turned legs. 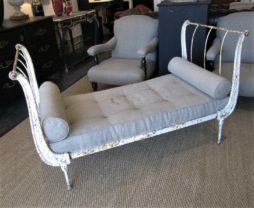 This chaise lounge looks great from all angles including the back. It’s a very rare piece of furniture & I don’t think you will ever find another like it. Compact day bed with arms that fold down. 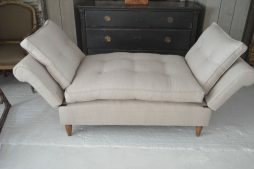 Reupholstered in soft French Grey linen.